My latest discovery, via Twitter, that wonderful source of mind food, is the splendid Mental Floss. It’s stuffed with amazing, informative and fascinating facts and articles. Among them these delightful examples of up-goer five speak. What on God’s good earth is up-goer five speak? I’ll explain. 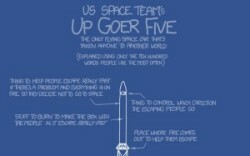 Up-goer five speak was inspired by Randall Munroe of the webcomic xkcd, who published a description of the Saturn V rocket using only the 1,000 most frequently used words in the English Language. 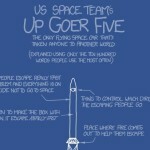 Thus restricted, the rocket was called ‘up-goer five’. This prompted Theo Anderson, a geneticist, who believes science should be accessible, to create a text editor that would force the user to write using only those 1,000 words. In their turn, two geologists, Anne Jefferson and Chris Rowan, created the Tumblr Ten Hundred Words of Science’, a collection of scientific texts that had been turned into up-goer five speak. The Mental Floss site has 18 examples from 18 different fields. I’ve taken some more from the Tumblr site as well. There’s only room here for a few, but I urge you to explore both sites and read them all. Especially the original ‘Up-Goer Five’. Incidentally, if you are a writer, a copywriter or need to write texts of whatever nature, this is a valuable exercise. Not specifically in précis or summary, though it’s that too. It’s primarily an exercise in clarity and precision. And in my opinion the world needs as much clarity and precision as it can get. Computer Simulation “Some people learn by trying things out. Some people learn by thinking very hard. I make a world inside a computer the way people think the world works, and then try things out, to see if we are thinking right.”Lots of scientists still don’t understand the value of this. Matthew Hoyles. Share book reviews and ratings with Clodagh, and even join a book club on Goodreads.